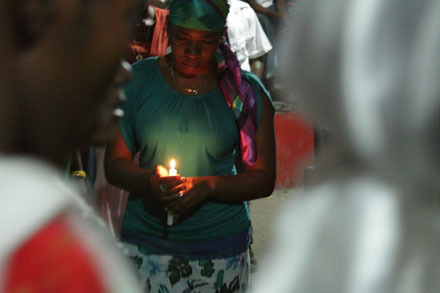 On Tuesday, March 8, V-Day at The New School will present a teach-in on gender-based violence in Haiti. The event, a partnership between the university and V-Day, an international organization combating violence against females, will highlight V-Day’s support of grassroots organizations that provide vital resources for Haitian women and girls, including legal support, education, and job training. As part of the teach-in, award-winning filmmaker Michele Stephenson will screen her new documentary Haiti: One Day, One Destiny, which tells the stories of Haitian recovery in wake of the devastating 2010 earthquake. A media maker of Haitian descent, Stephenson has received numerous international awards for her work, which focuses on human rights and race relations. Stephenson has been awarded a Sundance Documentary Lab Fellowship, a Diversity Award from SilverDocs International Documentary Film Festival, and a Grand Jury Prize for Best Documentary at the American Black Film Festival. A Q&A with Stephenson will follow the screening. This free event will be held from 6:00’9:00 p.m. in the Theresa Lang Community and Student Center, 55 West 13th Street, second floor. For more information, email vday@newschool.edu.